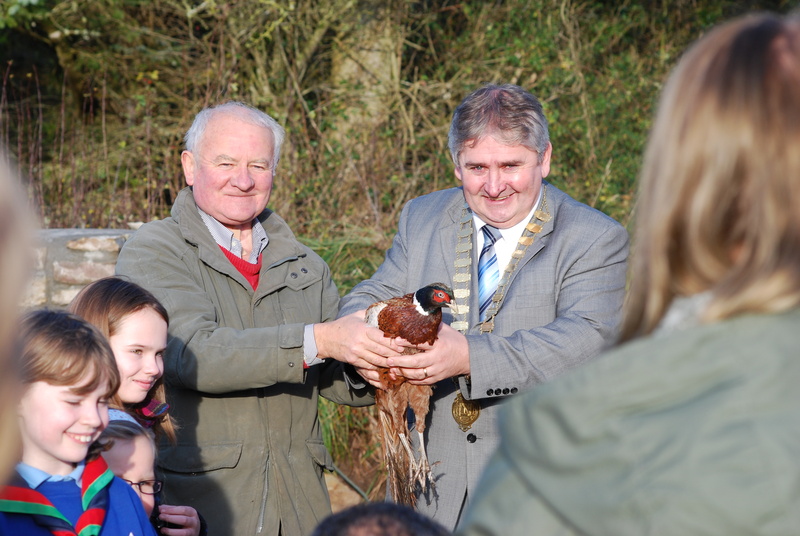 Up, Up and Away … Mayor Michael Maher releases the first of the pheasants at the launch of Abbey's Wildlife Sanctuary to the delight of the pupils of Abbey NS. In 2011, under the expert guidance of Dr Janice Fuller, a group of interested people in Abbey participated in Biodiversity training with a view to preparing an action plan for Biodiversity. 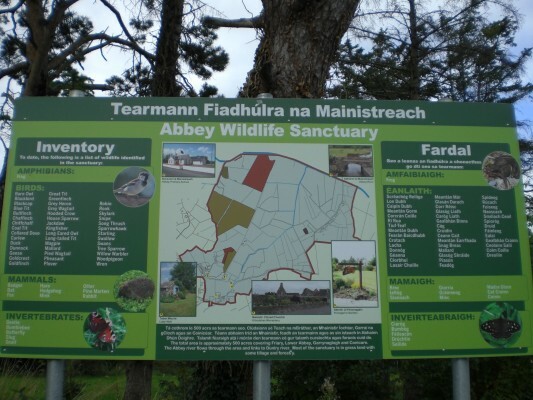 One of the actions that emerged during one of the training workshops was the creation of a Wildlife Sanctuary in Abbey. 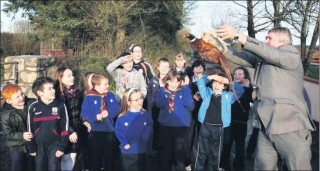 This was the brainchild of local farmer John Donnelly, a former president of the Irish Farmers’ Association. 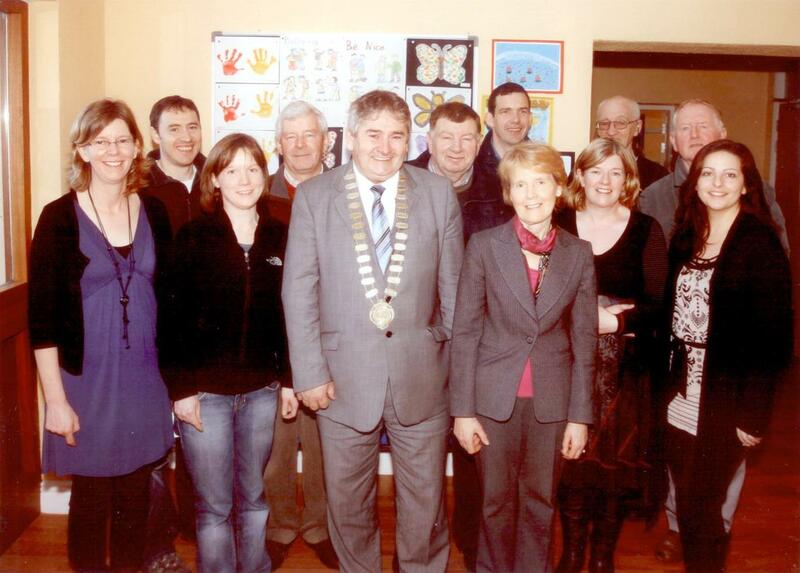 John liaised with a number of farmers whose lands span four townlands and cover a total of 500 acres. In total, fourteen farmers agreed to allow their lands to be preserved as a wildlife sanctuary. The local Primary School is situated at the entrance to the sanctuary and there was great excitement in December 2011 when pupils from the school joined with farmers and members of the local community to witness the release of the first pheasants by Mayor of Co Galway, Michael Maher, to mark the launch of the Wildlife Sanctuary. John himself has been involved in rearing young pheasants for release into the wild and it is hoped that with the setting up of feeding stations within the sanctuary they will continue to breed and propagate. The long-term objective is to establish a sustainable flock of pheasants in the sanctuary. A bird survey conducted in the sanctuary highlights the wide variety of fauna that exists and this was incorporated in a bilingual sign which is an excellent educational tool for the adjoining school and the wider community.